Called the father of English poetry, Geoffrey Chaucer is ranked as one of the greatest poets of the late Middle Ages (C. E. 476 c.–1500). He was admired for his philosophy as well as for his poetic talents. His best-known works are The Canterbury Tales and Troilus and Criseyde. The exact date and place of Geoffrey Chaucer's birth are not known. The evidence suggests, however, that he was born about 1345, or a year or two earlier, in his father's house located on Thames Street, London, England. It is likely that young Geoffrey attended school at St. Paul's Cathedral, and that he was introduced to great writing and the poetry of Virgil (70–19 B.C.E. ) and Ovid (43 B.C.E. –? C. E.). The first historical record of Chaucer reveals that in 1357 he was a page (a young boy in the service of a knight) in the household of the Countess of Ulster, the wife of Prince Lionel. During 1359–1360 Chaucer was in France with Prince Lionel (1338–1368). This was during the period of the Hundred Years' War (1137–1453) between England and France. Chaucer was taken prisoner. The English King Edward III (1312–1377) paid a ransom for his release. Little is known of Chaucer for the next six years. Documents indicate that in 1366 he was traveling in Spain on a diplomatic mission. Soon after his return he married Philippa, the daughter of Sir Payne Roet. Philippa was a lady of the queen's chamber. Chaucer developed close ties with John of Gaunt (1340–1399), the Duke of Lancaster, and other nobility (people of high status). In 1368 Chaucer was promoted from page to squire (a position of status above a page and below a knight). The year 1369 marked a turning point both in the fortunes of England and in the career of young Chaucer. John of Gaunt, the Duke of Lancaster, asked Chaucer to compose a memorial poem, written in English, to be recited at the Mass for his deceased wife. Prior to 1369 poetry in the English court had been written in French. French was the natural language of both the king and his queen. It is possible that he had written his English devotional poem, "An A B C," which is a translation from a French source, for the queen at some time before her death. The theme of his poem, The Book of the Duchess, which was written for intellectual and sophisticated people, was a fitting memorial to one of the highest-ranking ladies of the English royal household. Chaucer was sent abroad on diplomatic missions in 1370 and again in 1372–1373. The latter mission took him to Florence and Genoa, Italy. There he may have deepened his acquaintance with the poetic traditions established by Dante (1265–1321) and Petrarch (1304–1374). Times were good for Chaucer and Philippa because they were economically secure. John of Gaunt, the Duke of Lancaster, gave Chaucer a yearly salary of ten pounds, the normal income for a squire in an aristocratic or distinguished household. The king appointed Chaucer a position as controller (chief accounting officer) of taxes on wools, skins, and hides in the port of London. This position brought ten pounds annually and a bonus of ten marks. The City of London granted Chaucer a free residence above Aldgate. He remained at Aldgate until 1386, though he went abroad several times on diplomatic missions for King Edward, who died in 1377, and for King Richard II (1367–1400). In 1382 Chaucer was made controller of taxes on wine and other goods with the right to employ a deputy. While he was living above Aldgate, Chaucer completed his translation of Consolation of Philosophy by Boethius (c. 480–524), a Roman philosopher, whose phrases and ideas repeat throughout Chaucer's poetry. He also probably composed some short poems and Troilus and Criseyde, a tragedy. This long poem is set against the background of the Trojan War and is based on an earlier poem by Giovanni Boccaccio (1313–1375), an Italian poet. 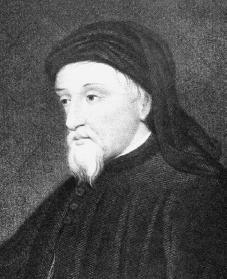 Chaucer lost his positions at the custom house in 1386 and moved to a residence in Kent, England. He served as a Member of Parliament from Kent. It is likely that Philippa died in 1387. Chaucer received his highest position, the clerkship of the royal works, in 1389. He served as clerk until he resigned in 1391. For a time thereafter he served as deputy forester for the royal forest at North Petherton, England. The king granted him a pension of twenty pounds in 1394, and in 1397 an annual cask of wine was added to this grant. King Henry IV (1553–1610) renewed and increased these grants in 1399. Between 1387 and 1400 Chaucer must have devoted much time to the writing of his most famous work, The Canterbury Tales. Chaucer gives his tale of pilgrimage, or journey to a sacred site, national suggestions by directing it toward the shrine of St. Thomas Becket (c. 1118–1170), a citizen of London and a national hero. The humor is sometimes very subtle, but it is also often broad and out-spoken. His original plan for The Canterbury Tales called for two tales each from over twenty pilgrims (people who travel to a holy site) making a journey from Southwark, England, to the shrine of St. Thomas Becket at Canterbury, England, and back. He later modified the plan to write only one tale from each pilgrim on the road to Canterbury, but even this plan was never completed. The tales survive in groups connected by prologues (introductions) and epilogues (conclusions), but the proper arrangement of these groups is not altogether clear. The series is introduced in a "General Prologue" that describes the pilgrimage and the pilgrims taking part in it. In addition to the translation and major works mentioned, Chaucer wrote a number of shorter poems and translated at least part of Roman de la rose, a late medieval French poem by Guillaume de Lorris and Jean de Meun. Chaucer's interests also included science. He prepared a translation of a Latin article on the use of the astrolabe, an instrument for finding the latitude of the sun and planets. He may also have been the translator of a work concerning the use of an equatorium, an instrument for calculating the positions of the planets. In December 1399 Chaucer retired and leased a house in the garden of Westminster Abbey, London. In October 1400 Chaucer died. Bloom, Harold, ed. Geoffrey Chaucer. New York: Chelsea House, 1999. Childress, Diana. Chaucer's England. North Haven, CT: Linnet Books, 2000. Chute, Marchette G. Geoffrey Chaucer of England. New York: E. P. Dutton, 1946. Wagenknecht, Edward. The Personality of Chaucer. Norman: University of Oklahoma Press, 1968. Thank you for this short piece. Please note that the dates given for Henry IV are for the (much later) French king of that name rather than the English one whose dates are 1367 - 1413.